Zonitis sayi, copyright Carol Davis. This is a blister beetle of the genus Zonitis. Blister beetles, the family Meloidae, get their name from their production of cantharidin, a defensive chemical that can burn the skin of would-be predators. Zonitis is a widespread genus of blister beetles with over 100 species described from around the world. However, it should be noted that its wide distribution may relate to the genus being poorly defined and future revisions may divide its members between other genera (as I believe has already happened for the Australasian 'Zonitis'). As it is, Zonitis species are characterised by fully developed elytra and functional wings, and cleft tarsal claws with two rows of teeth on the upper section (Enns 1956). 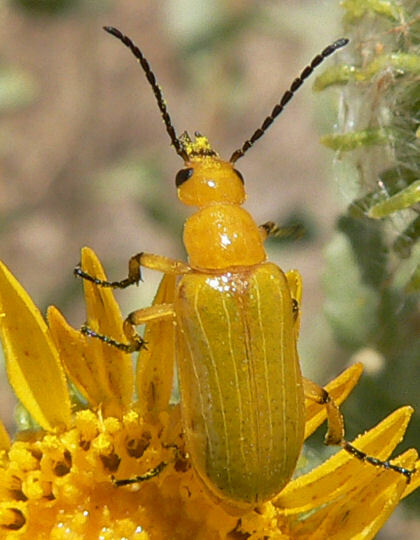 Adult Zonitis are flower-feeders, visiting composite plants (i.e. daisies and similar plants), and some species have the mouthparts modified into a tube for sucking nectar. Most blister beetles exhibit what is known as hypermetamorphism or hypermetaboly, where the larvae pass through morphologically differentiated stages before reaching pupation. Zonitis species develop as parasitoids or kleptoparasites of bees. Females lay large numbers of eggs (up to and exceeding 500 in a batch) on their host plant, most commonly on the flowers though sometimes on the undersides of leaves. The eggs hatch into active, long-legged larvae that attach to bees visiting the flowers and so get carried to the bee's nest. Once there, they moult into a less mobile stage and feed on the food stores laid aside for the bee's larva, and potentially on the larva itself. In the North American species Zonitis atripennis flavida, the beetle larva completes its development in a single cell but European species consume the contents of two bee cells before reaching maturity. Following the initial active instar, meloid larvae pass through four feeding instars before entering a quiescent, immobile stage called the hypnotheca or prepupa. The hypnotheca moults into another feeding instar before the larva finally enters the pupal stage (Bologna et al. 2008). What the point (if anything) of the hypnotheca is, I have no idea. However, it is worth noting that hypnothecae of another meloid species, Hornia boharti, have been recorded surviving for multiple years without feeding before moulting to the next instar. Once adults emerge from the host cell, they of course disperse to conduct their own affairs. Natural history data is patchy but indications are that many species are picky in their choice of host plant. From an economic perspective, their damaging role as a parasite of pollinating bees may be partially counterbalanced by their potential role as pollinators in their own right, but who can say which way the scales lean? Bologna, M. A., M. Oliverio, M. Pitzalis & P. Mariottini. 2008. Phylogeny and evolutionary history of the blister beetles (Coleoptera, Meloidae). Molecular Phylogenetics and Evolution 48: 679–693. Enns, W. R. 1956. A revision of the genera Nemognatha, Zonitis, and Pseudozonitis (Coleoptera, Meloidae) in America north of Mexico, with a proposed new genus. University of Kansas Science Bulletin 37 (2): 685–909. Presumably they're more unambigously harmful to beekeepers? I don't know if any attack honeybees. The hosts are generally solitary bees.